Any historian looking at events in the last 50 years or so in Alresford will inevitably meet up with the name of George Watson. George’s Dad was Jock Watson (real name George too), the gardener for Sir Francis and Lady Lindley at the Weir House. In fact George was born in one of the cottages next to Weir House: many of the estate staff lived in these cottages. This was in 1933, and he spent most of his childhood living on the Weir House estate. At that time this included all the river down to the Eel House, plus the fields on either side of the river: the Fulling Mill at that time was more of a mill and less of a house, as the old 1930s pictures show. This was also part of the Weir House estate, and George’s family lived there for a while, before moving back to one of the cottages by the house. The fields mainly were used for horses and cows – one of those fields, running up to the cottages east of The Dean, was used for the big horses that were used to pull the fire engine, then kept in the Old Fire Station in Broad Street. Another visitor who came to the Weir House for the trout fishing was Neville Chamberlain, around the beginning of the war, at a time when he was the Prime Minister (he died in November 1940): George found his visit particularly memorable as Chamberlain gave George a silver sixpenny coin! [That at least should be enough proof for Brian Rothwell to believe that Chamberlain did indeed visit the Weir House for fishing – see his article “Neville Chamberlain in Old Alresford?” in Alresford Articles, Issue 3, the Weir House Edition, from the Alresford Historical and Literary Society in 2013]. WW2 came, starting when George was aged seven. George remembers aircraft dropping incendiary bombs, 2” cylinders over a foot long, around Alresford: he found several embedded in the lawns of the Weir House, still live, and apparently with help from his Dad took them indoors: two of them were displayed proudly above the fireplace, on either side of the mantle-piece, like ornaments! The contents slowly formed a white powdery crust on the outside of the bombs, at the several joints along the body, and his Dad used to brush this white powder off into the fire, where it caused sparks and crackles! 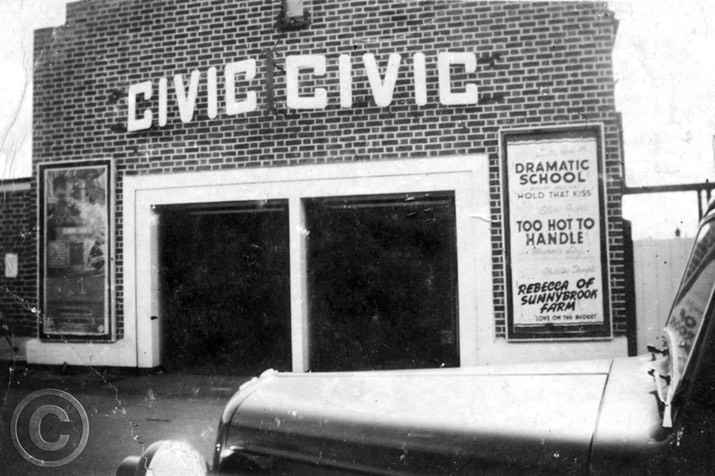 The local fire service chief was a frequent visitor to buy honey and watercress: one day he noticed the incendiaries and immediately called out the bomb disposal people to deal with them. George says they blew them up, making a six foot diameter hole in the field, mainly just from the over-zealous use of their explosives! Lady Lindley’s brother, Simon Fraser, was the 15th Lord Lovat, living at Beaufort Castle in Inverness: mobilised as a Captain in the Lovat Scouts, at the outbreak of war he volunteered to join one of the new commando units being formed by the British Army – by 1942 he was appointed the commanding officer of No.4 Commando. Either for R&R, or more likely before missions into Europe, Commandos were often billeted at the Weir House. They didn’t actually practice with guns around the estate, but the trout in the river were rather tempting, so they made catapults and managed to kill the fish that way, using small stones for ammunition. Real ammunition was used by the Alresford Volunteer Rifles, and they had an Armoury at the top of the Dean where Wild Brothers are now. Rifle practice was in the field North of the Bishop’s Sutton Road, with targets against the railway embankment. Inevitably some bullets went over the railway into the field beyond, and George collected some of these – with permission from the farmer, he added. 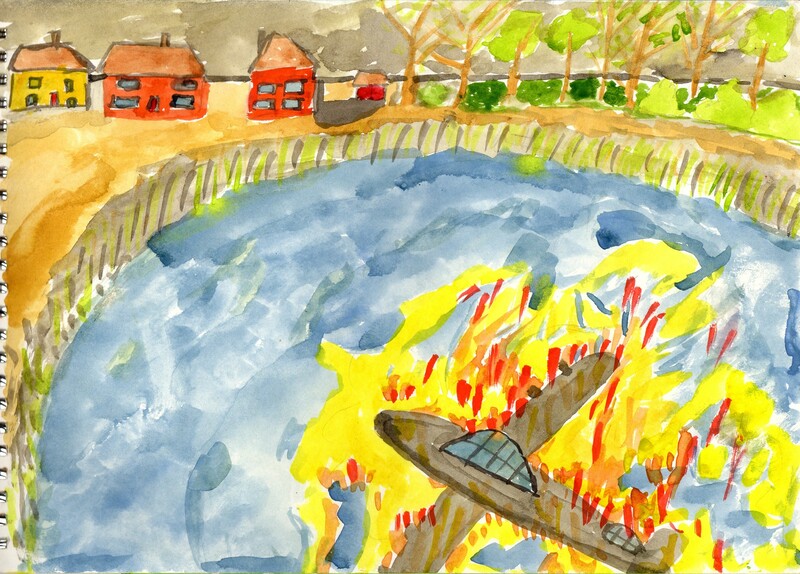 The other major event in the war was the crash of the Flying Fortress called the ‘Lady Luck’ one evening, at the top of Alresford pond. Like all the other lads George went racing up there on his bike, to see the fires, and find what souvenirs they could. In a combined effort they nearly managed to get a big machine gun out of the field, but the Policemen came along and stopped them. The US bomb group people took most of the interesting bits back. George later did some metal detecting to find some shells and other bits of the plane. George went to The Dean School, and then Perins: he has vivid memories of the pre-war time at the Dean School, in particular the toilets outside the back, which used an earth urinal. Every so often blocks of peat were delivered, to refresh the process, but even so in hot weather the smell was pretty bad. 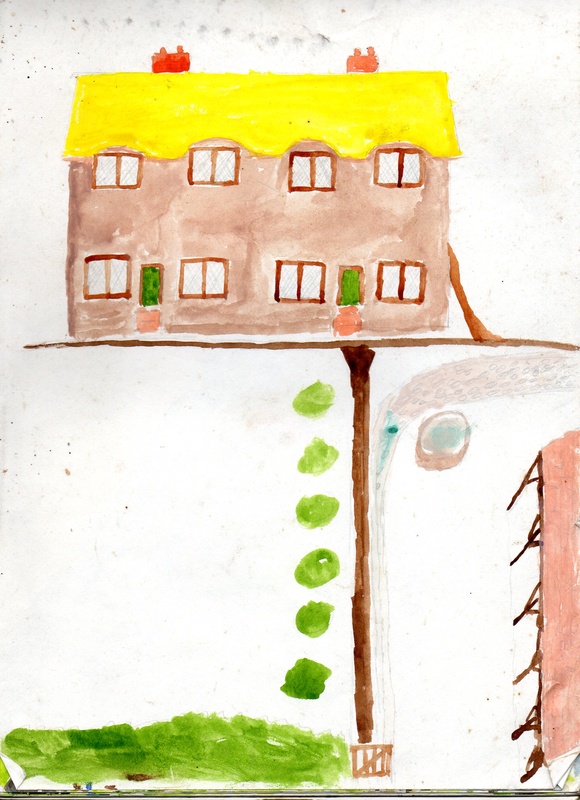 He thinks it might have been the caretaker’s job to take out the surplus solids and bury them behind the school in the lawn…. After leaving school George went to work on the cress beds for two years. He did his national service from 1950-52, in the Air Force, serving at Padgate and Odiham. Around this time, Sir Francis gave up part of his land on the South side of the river for use as the War Memorial gardens and Swimming Pool. 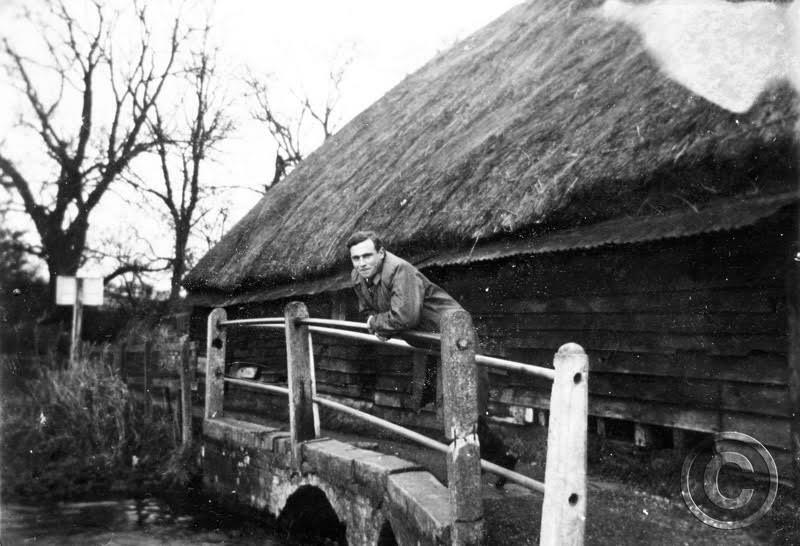 On returning to Alresford, George had jobs with Doidge the builder of West Street, and worked for Colonel Allen as a gardener: but then found his next major employment with Dudley Grace, building trailers. Pound Hill 2015: it is not known in which garage Dudley Grace started his trailer business! Both are modern conversions. Further down is O’Rourke’s Wine bar/Rio Rio, in the 70’s/80’s. 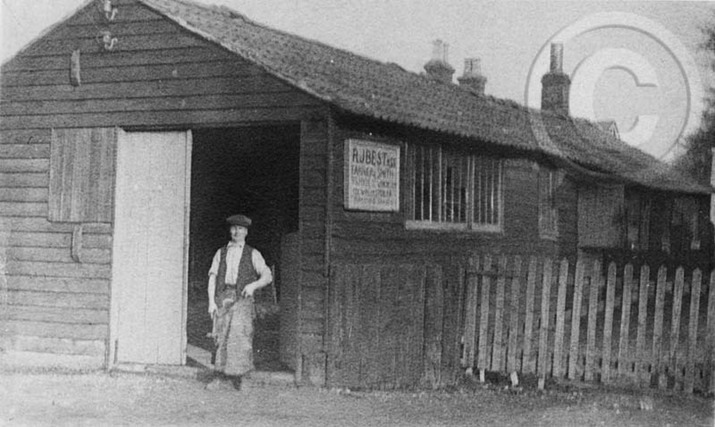 Dudley Grace started his business based in the field at the corner of Drove Lane, where he had a house. Scattered around the field were the remains of old vehicles, where Dudley had removed the axles to make trailers. These were then constructed in the garage/shed premises on Pound Hill initially, but he then took over a long low building in the Dean that was the Smithy and Forge previously run by Mr Best, in the 1920s, and later by Tom Baker. This was next to the Dean School, where the curtain factory now stands. 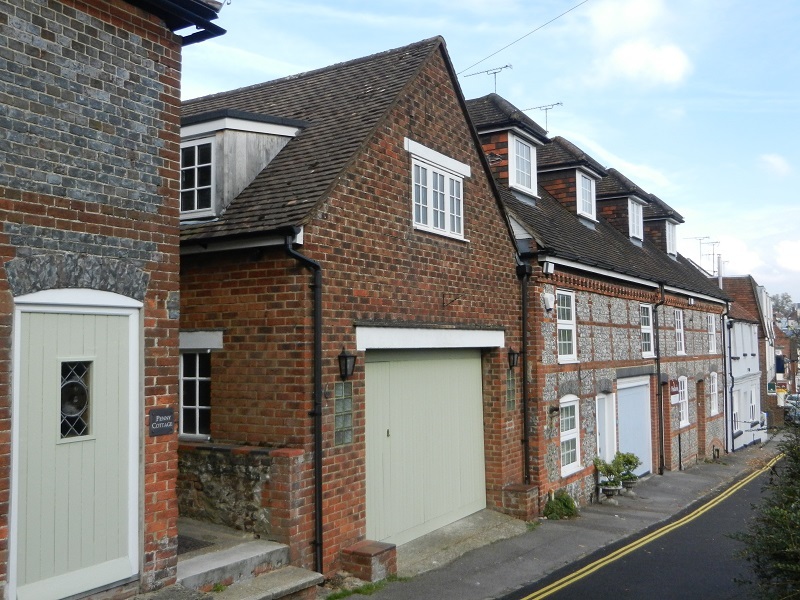 Tom Baker lived in one of the houses opposite the Dean School, and was known for firing his anvils at the Alresford carnival in the early 1950s, famously destroying his own hat once when he got too close. George worked there for a few years, first in the forge, making the trailers, and later over the road in the newly built sheds there, that later became known as Warwick Trailers. 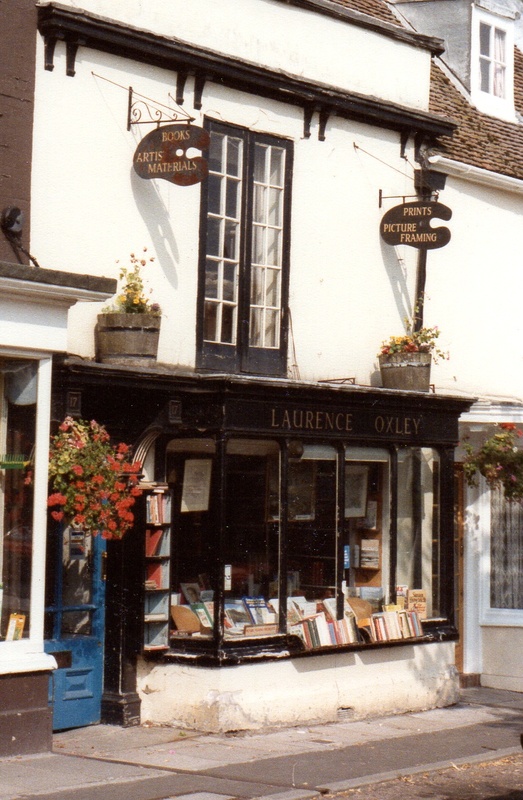 Laurence Oxley’s shop on Broad Street in the 1980s. After this a change of career was on the cards, in around 1957. He had been repairing furniture for Oxley’s bookshop in Broad Street part time, so he left the trailer business and started full time work for Mr Oxley. He also married Beryl, who came from Ropley, and worked for Eddolls on Broad Street: they lived in the George Yard. His work at Oxleys involved making picture frames, repairing and restoring furniture, and also occasionally – once every 2-3 months – running the printing business in the basement, particularly when they needed more original prints. This work frequently involved printing from copper plates, and the most notable of this output was of the drawings and cards produced by Albert Edward Wade (see the Alresfordmemories.wordpress.com article about Wade). There were also Parish magazines, and other printing for the town’s businesses. George also printed Moody’s history of Hampshire there, which contained 200 plates of A5 size, and was involved with creating the Wade painting that is now in St John’s Church. George provided a lot of his Wade souvenirs, including the painting showing the demolition of the water tower at the top of Jacklyn’s Lane, to Roy Robins for the town museum: this now hangs in the Alresford Library. Oxley also cleaned pictures at this time, and George was involved in this work, cleaning the picture of Charles I that used to hang in Ropley Church, an oval picture of Henry Perin, and one of the Tichborne dole (as below), prior to the loan from Tichborne House to an Exhibition in the USA. The picture shows Sir Henry Tichborne distributing the Dole in 1670, and was painted by the Flemish painter Giles Tilburg. 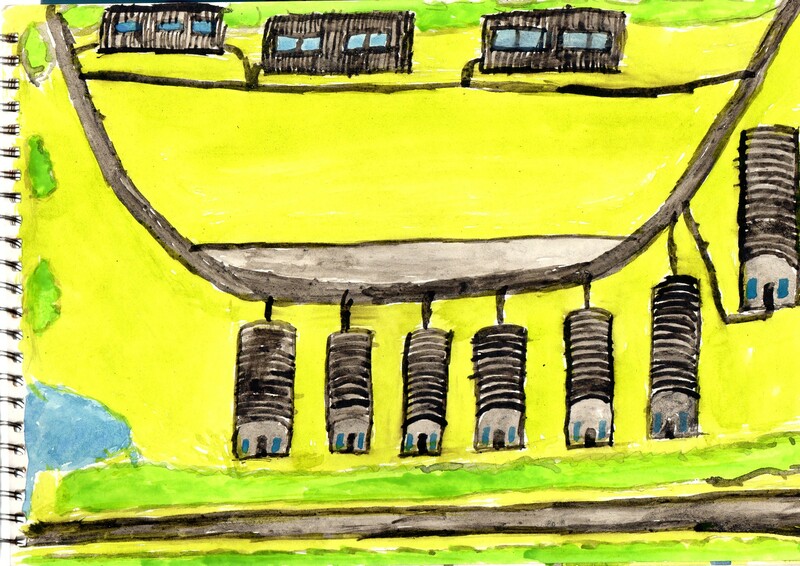 Interestingly, most of the people shown, including the villagers, can be identified from the key that goes with the picture. 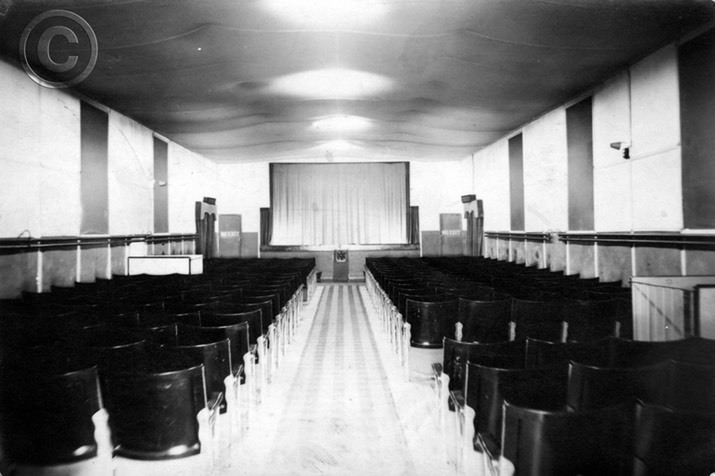 Several other pictures with WWII bomb and fire damage from Portsmouth Cathedral were also cleaned at Oxley’s. From 1957 to 1977 George also served as a part-time fireman in the Alresford Fire Service: somewhere in there he also fitted in occasional work for White & Etherington, who were based in the old ARP yard on Mill Hill – the main result of this labour seemed to be pit props, made from local trees cut into 6” or 8” square posts. In 1977 George and Beryl decided to set up their own business doing the carpentry work and making picture frames. So he rented single room premises – the barn on Mill Hill, and ran the business there for 10 years. For many years after that his wind vane on the barn had an image of him working at the bench – see the photo. 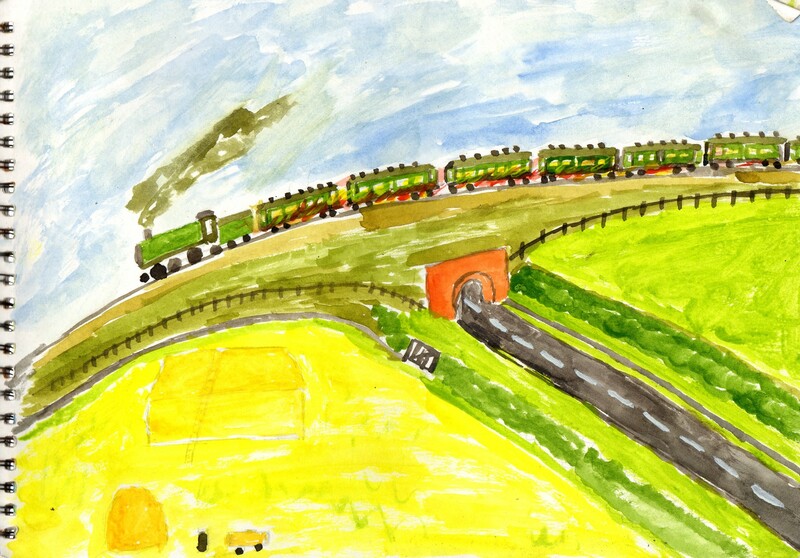 Being just a barn, George had to dash home occasionally to George’s Yard, to get to a cup of tea and a toilet! The barn of course has now been totally rebuilt into a smart new house. 1982: George’s barn on Mill Hill, with Wykeham house on the left, and his personal wind vane! After 10 years on Mill Hill, George felt like another change, so they set up a picture framing business in the Old Fire Station at the bottom of Broad Street. Beryl was also involved in this business, choosing and cutting the mounts for the pictures. While there, for around 13 years before retiring, George found various other old articles in the Fire Station that were donated to the Museum. George was very keen to help with the Roy Robins project to create a town museum, and passed over a lot of items to help him establish a good collection of the town history. George had collected many interesting items in his time in Alresford, for example things found within buildings when renovation work was undertaken. When Mr (AE) Childs closed his hardware shop in East Street suddenly, to retire to a nursing home, he left a lot of old stock and other items in place. So when the house went up for sale, George rescued a few samples, including the shop ledger, and these were also donated to the Museum. There are many more stories he could probably tell…..
….just a few of George’s stories about buildings in The Dean! 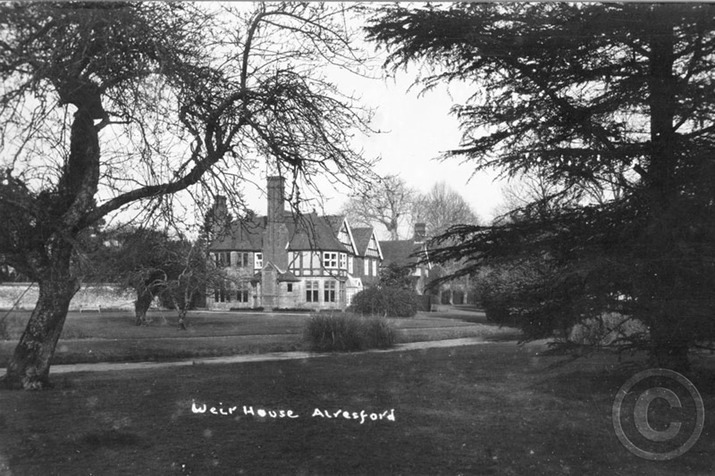 Many pictures have been found of the various old buildings and businesses in The Dean, which can be seen on the website www.Alresfordheritage.co.uk. Some are shown above, and as small pictures below, all are the copyright of the Alresford Heritage website, or other copyrights, and reproduced here with permission. Behind Tom Baker’s Smithy was a shed, and Dudley Grace parked the buses he owned around this shed, accessed up a little side lane. 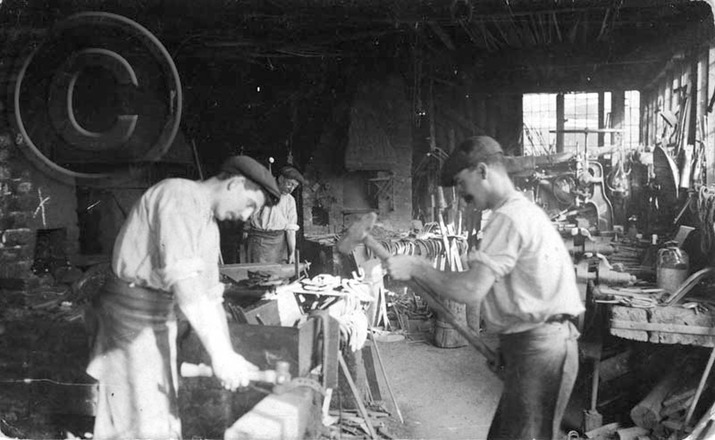 Pictures of the Forge in operation can be seen on AlresfordHeritage.co.uk. The other bus yard, owned by Mr Vickers, was accessed via the lane near Fairlight Villas, where a printing works existed until recently: now there are two houses there. The Vickers bus service is featured in another Alresford Memories story. There is another lane on the other side of Fairlight Villas, next to Faccombe Cottage, which leads to the cress beds that were owned by the Dorey family, who lived in the big house accessed from Ladywell Lane – this house backs on to these cress beds. 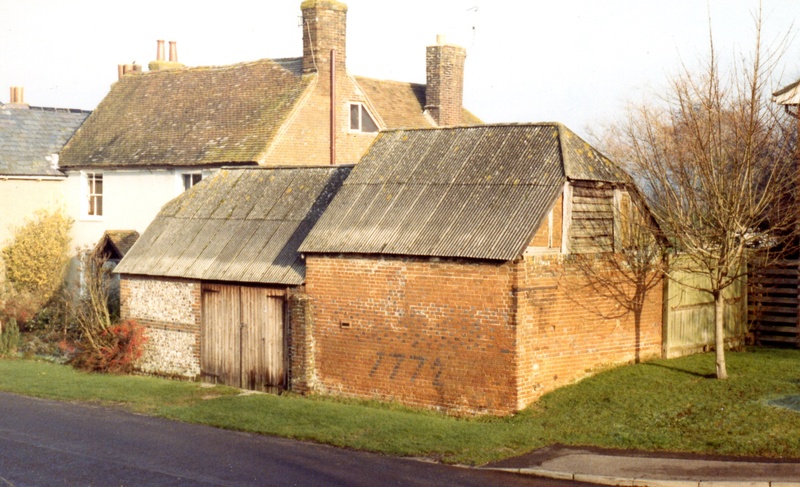 A spinster relation, Miss Dorey, lived in the old farmhouse further up the Dean, now called the “Malt House” with the shed at the front, and also the barn – labelled and dated in the bricks “1772” – on the east side of the road. George refers to this barn as the hay barn, as he regularly used to stack hay into there. Opposite this house was the Dorey family turkey farm, extending from where Huxley’s and CLC are now, down to the Riverside Cottages. The town gas works was slightly up the hill from the turkey farm. The current house name comes from earlier, from before when John Howe lived there, around 1828. He was a clockmaker, but he also continued the malting/brewing business, using the site of the house next door, #58, now Western Court (or similar). The barn has now been modernized, but the picture shows it in the 1980s. John Howe’s previous premises, for his watch and clock-making business in 1803, was 17 Broad Street, later to become Laurence Oxley’s shop! Valdean, the caravan park, was originally a US Army camp in the war, with semi-circular section Nissen huts spread around the road network the Army laid down in the field there. The Valor family bought the field from the US Army, and first used the huts for the temporary housing of returning soldiers and their families. These were later replaced by the current mobile and trailer homes. 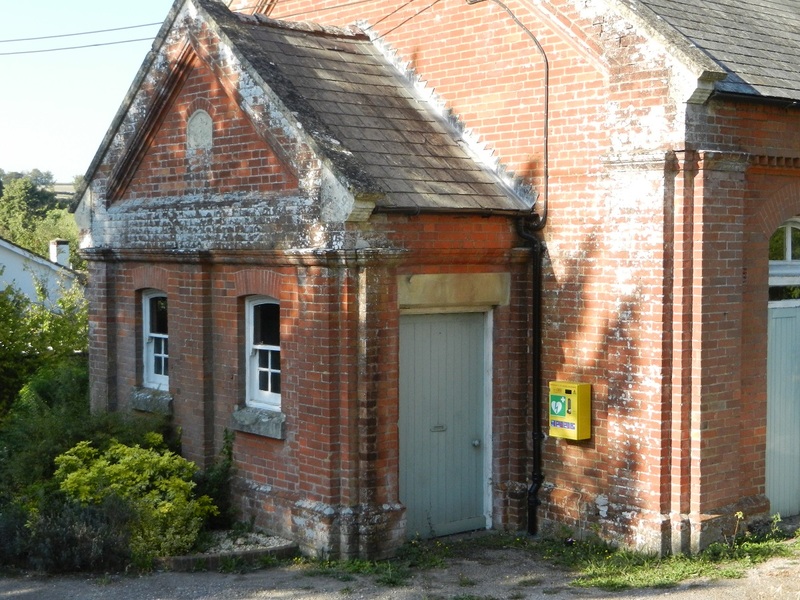 Opposite the Valdean caravan park, the Alresford Volunteer Force Armoury was labelled with a large green painted wooden sign board, that had a red edging, but no pictures of this exist on the outside of the old flint built building there, which now faces onto the yard owned by Wild Brothers. This must be the old armoury, but if anyone has a picture to prove it, we’d all like to see a copy! 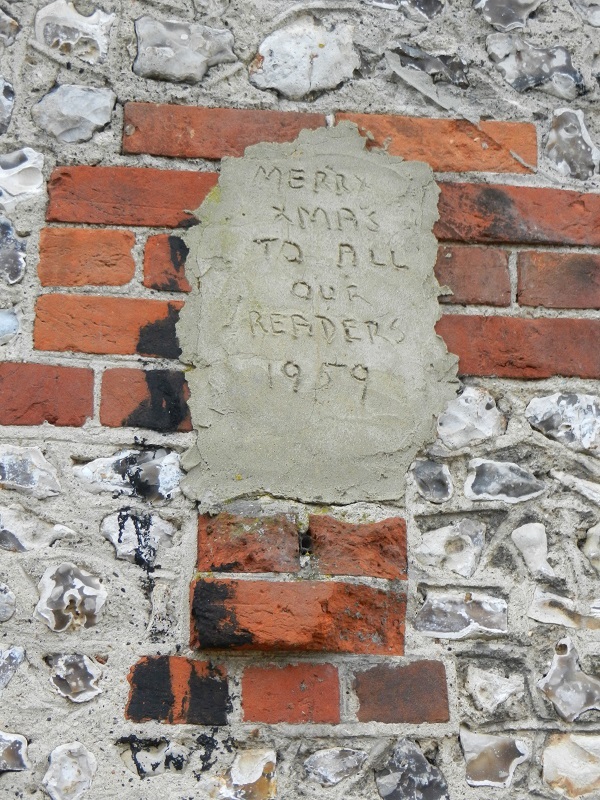 The nearest modern (1959) approach to such a sign is pictured here, positioned high on the flint wall. The old (1823) Methodist Chapel on Pound Hill appears to back onto this flint walled building, which must have been the AVF Armoury. 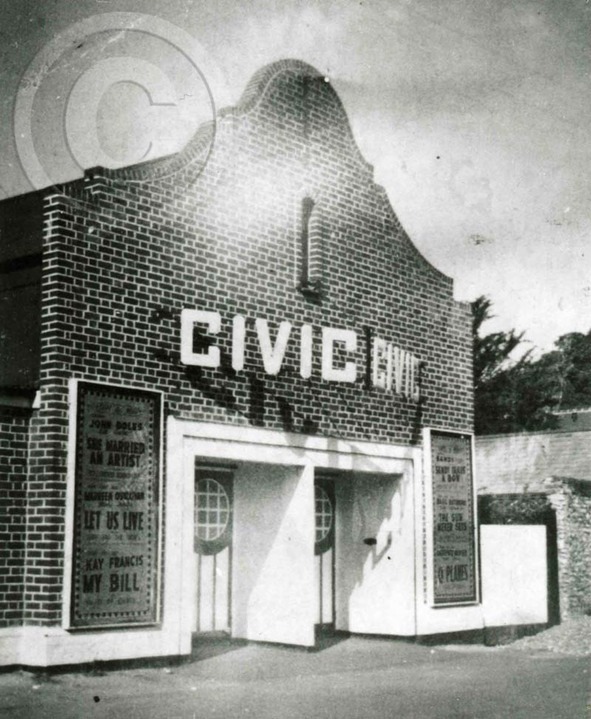 Subsequently a further reference was found: Digby Grist in the Alresford Displayed of 1980, mentions that the 16th Hampshire Volunteer Rifle Company was formed in 1860, and had its drill hall in the premises of the British School in the Dean – which Digby said was in 1980 occupied by Wild Bros, so is presumably the same building that became the Armoury. These days George can often be seen on his big mobility scooter heading out for his morning drive, which can include a visit to the Golf Club, or a trip to Alresford shopping: he specially appreciates the help given by the local shopkeepers, who will frequently be seen delivering the required items to George, parked outside on the pavement. The Alresford Museum Artefacts listed as found by George Watson, and donated to the Alresford Museum – some coming from the Old Fire Station – are as follows. A1019a: Fireman’s bucket with leather strap, which could have been similar to the ones in the Alresford Old Fire Station. But Geo Watson bought this when in the OFS, it was made by Merryweather, who made the fire engine..
A1019b: Glass bulb fire extinguisher, known as a Harden. A1019d: Shells from site of Lady Luck Flying Fortress crash. A1019e: A section of a charred beam from Lawrence Oxley’s house (17 Broad Street) in Alresford’s first fire. A1019f: Inside of incendiary bomb, picked up by GW from the lawn of the Weir House after raid in WW2. A1027: Lead bullets from Alresford Volunteer Rifles practice range, found by metal detector near the rifle range, BS Road, 29 Sept 03 (approx?) by permission Mr Cole of Western Court. A1006: Cap badge Alresford volunteer rifles: GW found this with the metal detector when looking for bullets on the rifle range, see 1027 above. A1028n: Indentures on parchment: Nathaniel Bradley of Alresford 1672 and 1748 in Essex – GW said he collected it from Childs shop when it was closed down. Other items were Bachelor’s bottles (A1020a to d), and the town batons (A1029a and b). The NATT Alresford Museum Committee are grateful for these donations, now added to the town collection of artefacts and records. George also donated various other documents and photos to the Museum, which are listed separately. 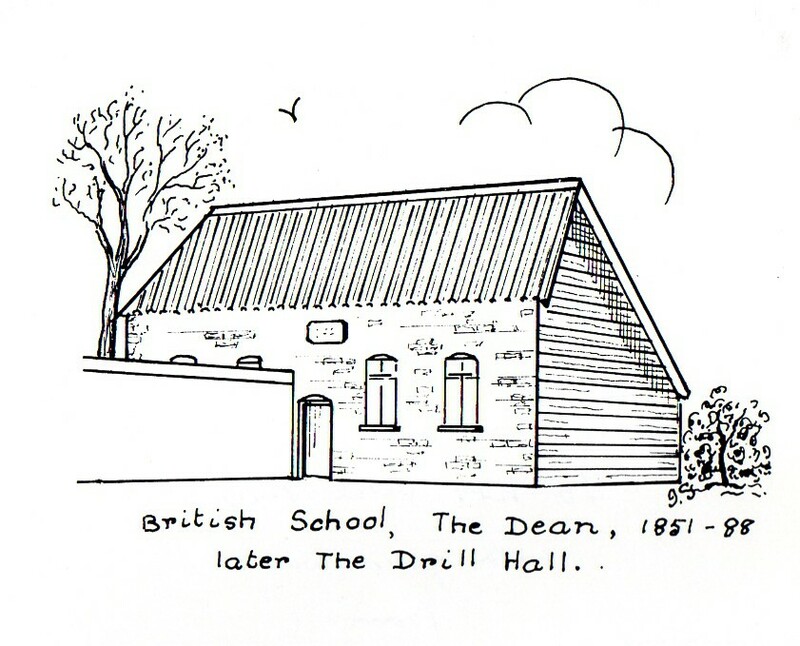 Isabel Sanderson, in Volume 9 of her series “Dwellings in Alresford” includes just a sketch of the AVF Drill Hall in the Dean, later their Armoury, with the comment that this was the British School from 1851-1888. 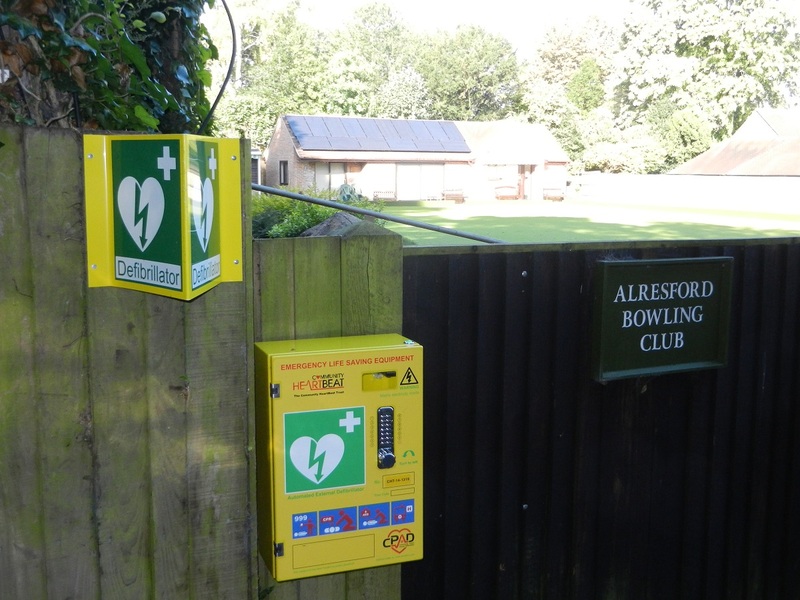 The Alresford Community Cardiac Defibrillator Scheme has been established as the direct result of an initiative suggested to the Alresford Pigs, who established a committee led by Chris Lillywhite of Alresford Pigs and Dr Peter Stokes from the Alresford Surgery. The scheme is operating in co-operation with the Community HeartBeat Trust, a national charity focused on the provision of life saving defibrillation services to local communities or groups, working with the local ambulance services (www.communityheartbeat.org.uk). 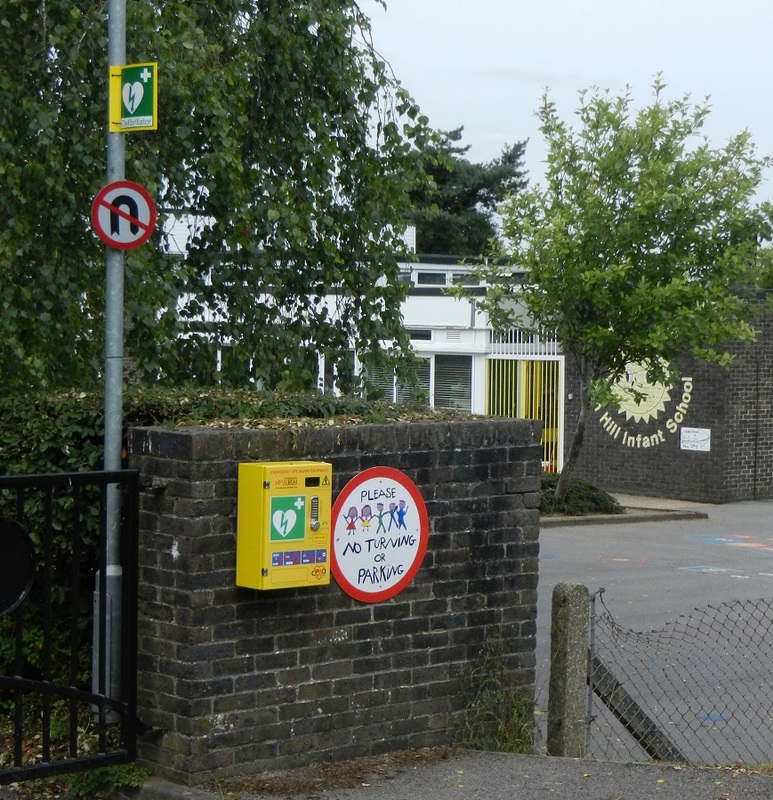 During the Summer of 2015, seven defibrillators have been installed around Alresford and in Old Alresford, adding to the two other previous installations of similar units: an eighth new unit will be installed by the year end. Inside the boxes at the various locations there is a simple, light weight “Automated External Defibrillator” (AED). This is a portable, light-weight battery powered electronic device that automatically diagnoses a patient who appears to have breathing difficulties or the symptoms of a possible heart attack. It looks for and analyses any life-threatening cardiac arrhythmias of ventricular fibrillation and ventricular tachycardia in a patient’s heart, and is able to treat them through defibrillation – the application of electrical therapy which helps stop the arrhythmia – thereby encouraging the heart to re-establish an effective rhythm. Heart treatment, if needed, is most effective if applied very quickly after the patient shows the symptoms, particularly within the first ten minutes after the event, which is why multiple units are positioned around the town. Before it arrives, use chest compressions and mouth-to-mouth resuscitation. With simple audio and visual commands, AEDs are designed to be simple to use for the layperson. This device should be taken to any unconscious or semi-unconscious casualty: if the patient is diagnosed as not needing any heart rhythm treatment, the machine will not do anything, and will not hurt the patient. How to open the box! All the bright yellow boxes have a key-coded lock, and a Serial number stamped on the outside. By dialling 999 and asking for help, the Emergency Services will despatch an Ambulance immediately, and a first responder if possible. The operator will also provide the keycode to open the box at your nearest operational defibrillator, and tell you where it is. Hopefully you can send someone to this location, to collect the bag containing the AED, and rush this to the patient. While they do this, you should continue chest compressions and mouth-to-mouth resuscitation alternately, to provide assistance while the equipment arrives. The AED will give clear instructions for use by way of an audio-visual display panel, and really can be used without any previous training. However the Community HeartBeat Trust is planning to arrange local awareness sessions for those wishing to learn more: the first is on Saturday November 14th at the ARC, from 1000-1230. Where are the new public access units? Sun Hill School Entrance: This unit is on Sun Lane, at the top of the hill, outside the Sun Hill school gate. The Serial Number is CHT-14-1320, where presumably the CHT stands for Community Heartbeat Trust, the 14 is for the year 2014, when our project started, and this is unit 1320. This unit was financed by the Alresford Pigs. Alresford Bowling Club: This unit is also on Sun Lane, at the gate giving entry to the Bowling Club, where the white lines on the road try to stop cars parking across the access. This unit was totally financed by the Bowling Club, but they have made it available for public use also. Serial Number is CHT-14-1319. 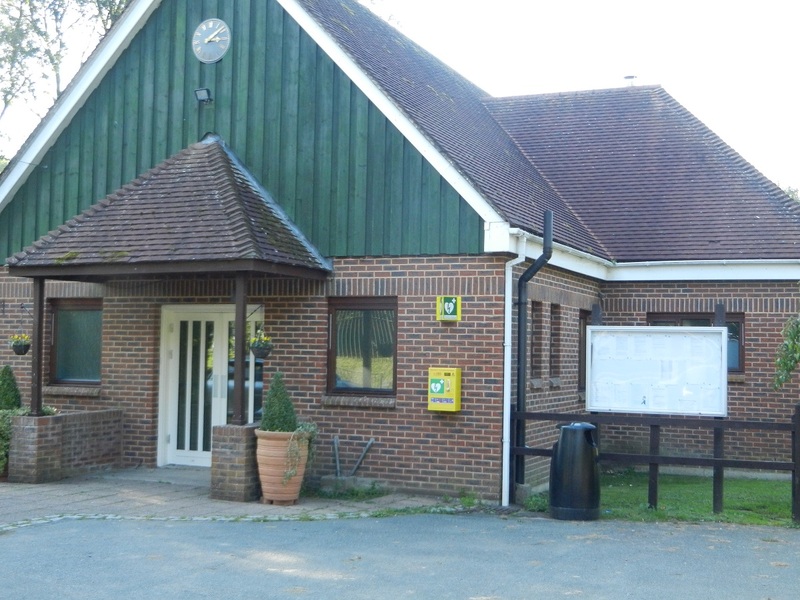 Alresford Community Centre: Next to Lloyds Bank at the top of West Street, in the outside foyer of the Community Centre doorway, there is another unit, with Serial Number CHT-14-1325. This unit was financed by the Alresford Pigs. Old Alresford Phone box: This unit is in the phone box beside the Village Green, on the Basingstoke Road. 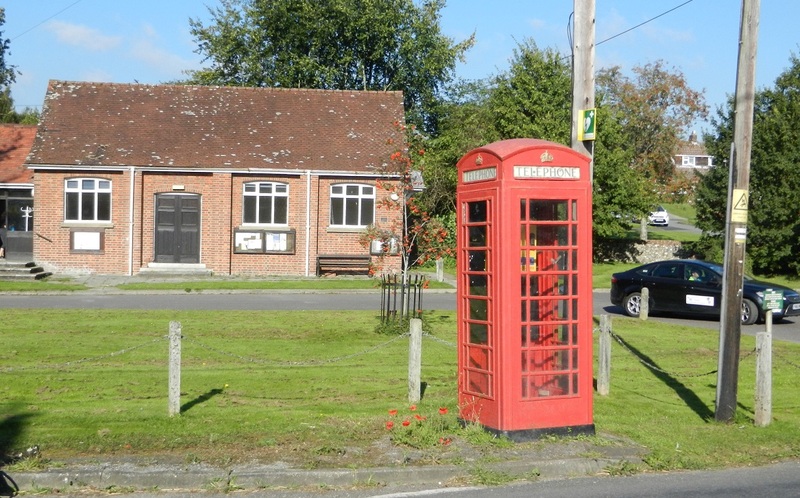 There is no phone in the phone box, it was disused, and Old Alresford Parish Council have retained it, and have financed the purchase and installation of the Defibrillator. Serial Number is CHT-14-1318. 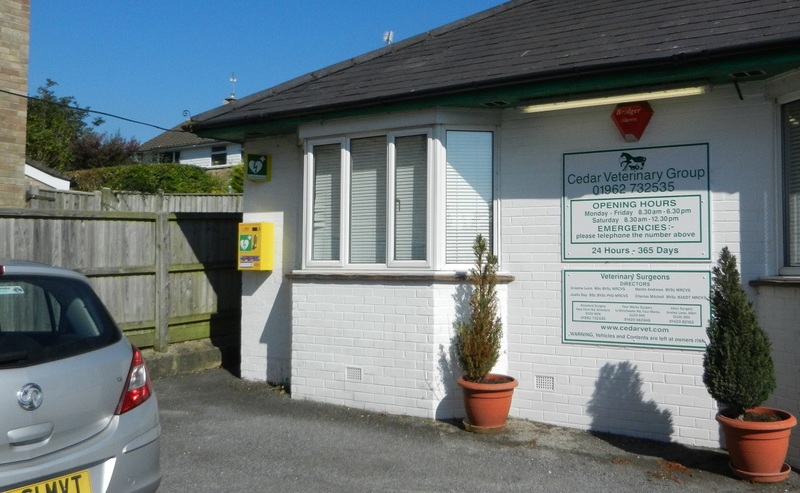 Cedar Veterinary Surgery: On New Farm Road, at the junction of Covey Way, Cedar Veterinary Surgery have allowed the unit to be installed at the front of their building, on the left corner. The Serial Number is CHT-14-1323. Defibrillators are not recommended for use on animals! This unit was financed by the Alresford Pigs. ARC: The Alresford Recreation Centre on the Avenue has a unit installed at the left hand side of the building, by the door to the Visitor’s Changing Rooms. This is also available for public use, but was financed by significant contributions from the Alresford Rugby and Football Clubs and the Tennis Club, as well as the Alresford Recreational Centre Social Club. Serial Number is CHT-14-1322. 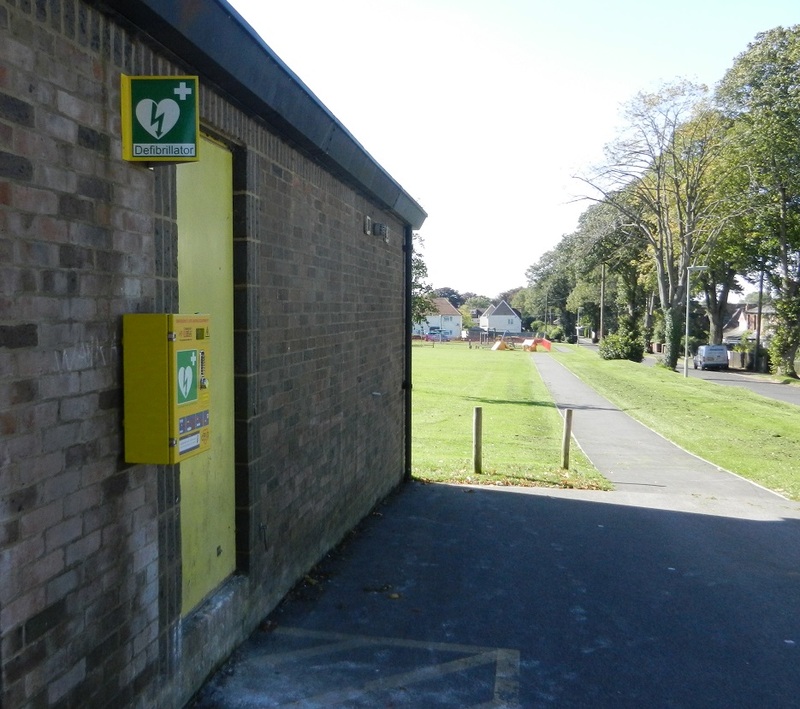 Stratton Bates Recreation Ground: The Defibrillator here is installed on the Grange Road side of the building, at the back of the building, next to the rear door, and facing/visible from Grange Road. The Serial number is CHT-14-1324. This unit was financed by the Alresford Pigs. 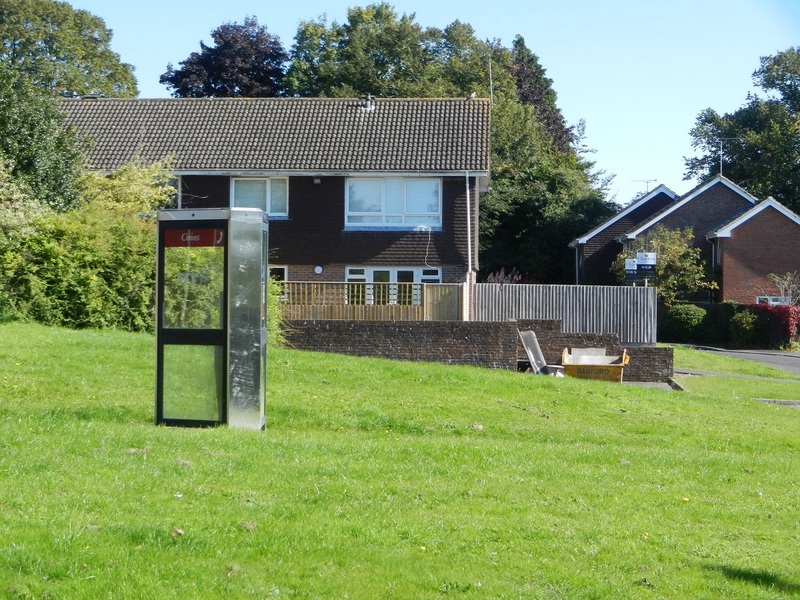 Linnets Road: Hopefully to be installed before the end of 2015, another unit financed by the Alresford Pigs is planned for installation in the telephone box near the highest point of Linnets Road, on the path near the original two shops. The phone in this booth was vandalized, ie the handset was cut off, around a year or two ago, but BT did not think it worth replacing! So the organizing committee approached BT and ownership has been re-allocated to them, for a nominal payment, for use as a Defibrillator housing! The new defibrillator was installed in February 2016, and is now operational: even the windows of the phone box have been cleaned up a bit! The phone booth now boasts a yellow and green Defibrillator sign facing the road. The Serial number is CHT-14-1321. The Defibs need your help too! The units are inspected every month, and any problems are sorted. 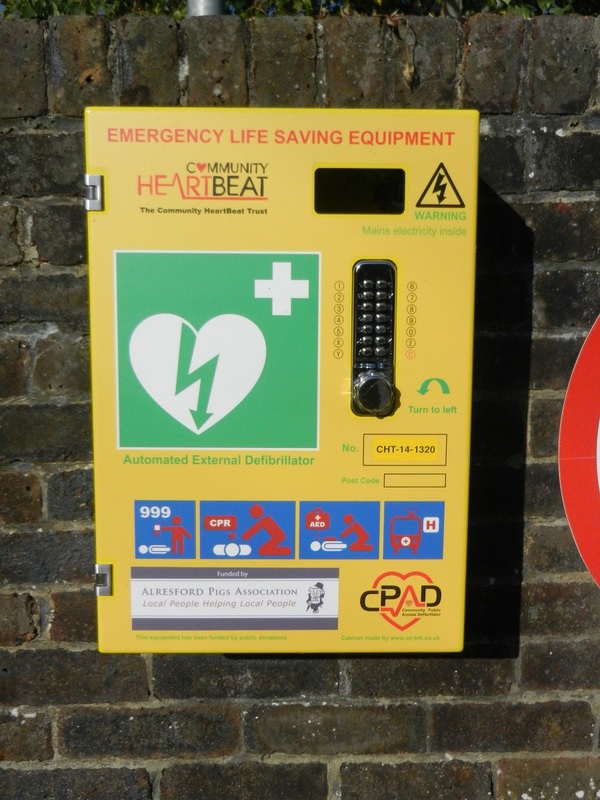 But all the Defibrillators need annual maintenance, replacement of batteries and the adhesive pads supplied to attach to the patient, which costs around £80 per machine per annum. Your help is needed to raise this money to keep the service operating. Please help us keep these units operational, and donate something to our scheme now: please donate via the website, at tinyurl.com/DefibAlr. 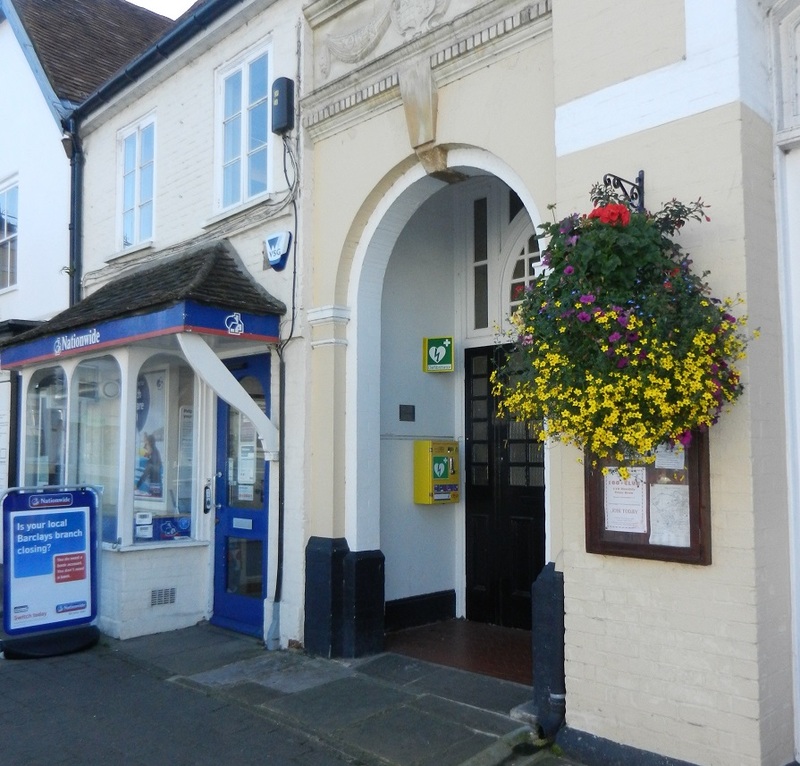 Alresford Surgery: Alresford Group Surgery in Station Road has a Defibrillator available for use on their patients: indeed to first such unit used at Alresford Surgery was donated by the Edward Pay Medical Fund. This defibrillator is part of the surgery’s equipment, and is not a public access unit. The Emergency Responders and the Emergency Ambulances also carry such equipment. 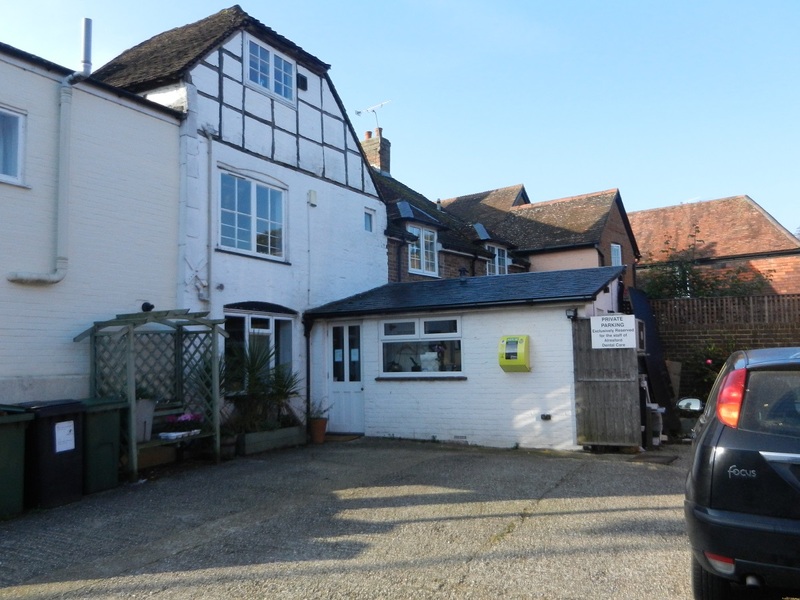 The dentist’s surgery on Pound Hill, known as Alresford Dental Care, has installed a defibrillator for which public access is allowed. This has been operational for over a year, and operates through the Hampshire and Isler of Wight Dental Committee scheme. It is located behind the surgery, in their car park, which is accessed from the Dean. When the Dentist’s surgery is open, they can provide assistance and give the access code. When closed, the normal 999 call is needed to obtain the access code – their box has no serial number, so the location (the Alresford Dental Care car park) should be quoted. 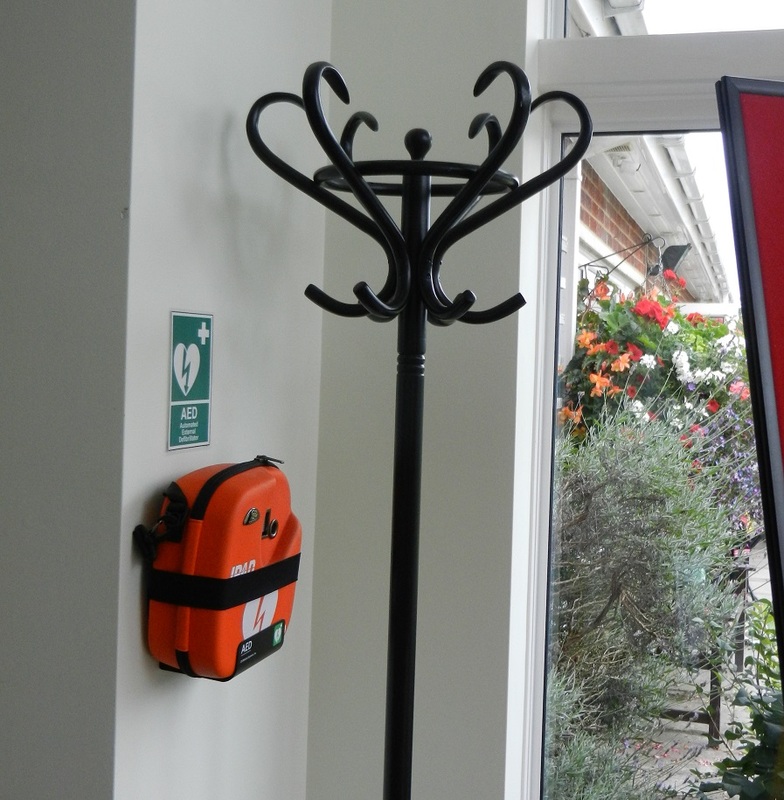 This Defibrillator has been financed by the Golf Club itself, for members and visitors, and is located in the foyer, next to the trophy cabinet, at the entrance to the Club House. In case of emergency, contact should be made with the Office or Pro-shop, who will bring it to the patient if he is out on the course. Northington: This unit is installed at the front of the village hall, just off the B3046 on the corner of the turning towards the Church. The reference number for this unit is CHT-13-962. Preston Candover: The unit here is installed on the outside of the village hall, in the car parking area opposite the school. The reference number for this unit is CHT-14-1245. 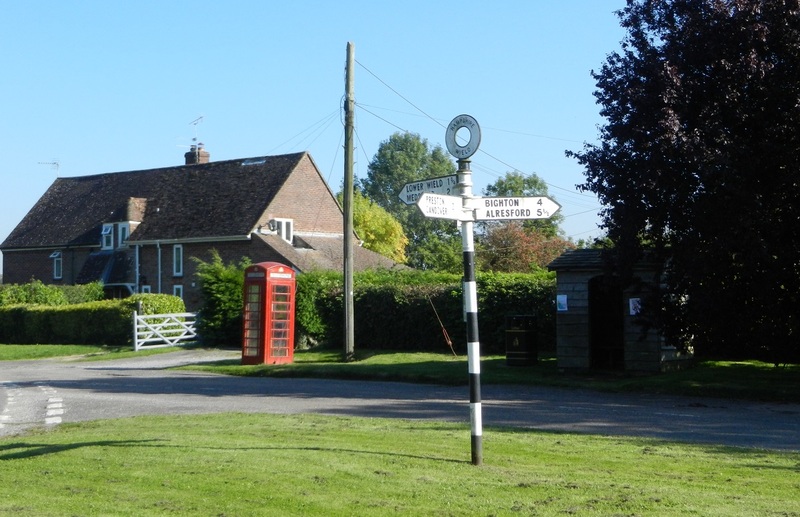 Upper Wield: At the cross roads on the corner of the village green, next to the bus-stop and shelter, there is a disused telephone box on the grass verge, which now houses a yellow defibrillator box! The reference number here, for this unit, is CHT-10-259, which presumably means the unit was allocated to Upper Wield back in 2010! 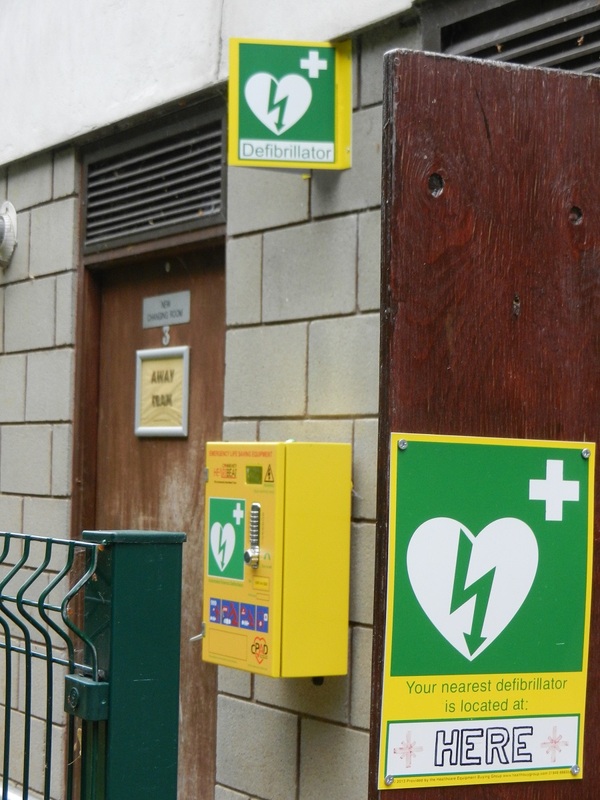 Bighton: July 2017, and a little bird tells me that a new Defibrillator has been installed at Bighton Village Hall, after a very short fund-raising period produced the money needed from local donations.